The Sloughi is a sighthound of the Berber people of North Africa. They hail from the deserts covering what is now Morocco, Algeria, Tunisia and Libya. A rare breed outside its homeland, they are traditionally used for hunting various prey. This includes animals such as hare, gazelles, foxes, jackals, mouflon (wild sheep), and bush pigs. Training begins at three to four months of age with rodents, and by two years of age dogs are expected to be able to take down a gazelle. Although they are used in the chase, prey is often located by either using falcons, or another African breed, the Aidi. Like the Saluki, the Sloughi is not seen as unclean by the nomads, as other dogs are. They are El Hor, the ‘noble one’ and regarded with the same respect as a male in the household. Their litters are a call for celebration and they may share tent and blankets with their masters. Often they are decorated with jewelry and their legs are ritually branded with the belief it helps them gain speed. As a secondary role Sloughis are also bred for protection. Guarding its owners, the encampment, and flocks from invaders such as predators and thieves. In their homeland two varieties of the Sloughi exist, the Mountain and Desert. The Desert Sloughi is more slender with a lighter build while the Mountain Sloughi is thicker, yet still an athletic dog. Throughout the rest of the world these two types are interbred. Rock engravings of dogs similar to the Sloughi exist in Northern Africa dating back thousands of years. Having existed since before written record it is impossible to know the Sloughi’s exact ancestry. Before DNA testing the accepted theory was that all sighthounds descended from the Middle East. All breeds sharing links through the Saluki and Afghan Hound. Under this theory the Saluki spread to the Maghreb region of Africa which developed into the Sloughi. Then in turn the Sloughi developed into the Azawakh. With more recent testing it is now believed sighthounds developed at different times in several regions due to natural selection and the needs of their human companions. DNA evidence calls into question just how close the ties are between these breeds. However, the Azawakh and Sloughi are one of the few breeds that share a rare glucose gene found in jackals. The only other dogs with this trait are Japanese breeds. It is believed that the Sloughi was brought to the Iberian Peninsula with the Moorish Invasion in the 700s. This would have allowed them to influence the development of the Galgo Español. However they were not known by the majority of the western world until the late 1800s. 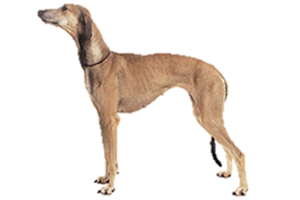 Confusion at the time caused the breed to be seen as a smooth-coated Saluki and it was not independently recognized until 1935. Is the Sloughi Right for You?